Upon further research I was shocked to find out that it can be purchased for a whopping $529!!! Whoa! Get outta here! I had a BRILLIANT idea I tell ya – BRILLIANT! I have this decorative outdoor rubber mat already sitting at my front door just waiting for a new life. I cleaned if off a little with some Armour All tire cleaner. 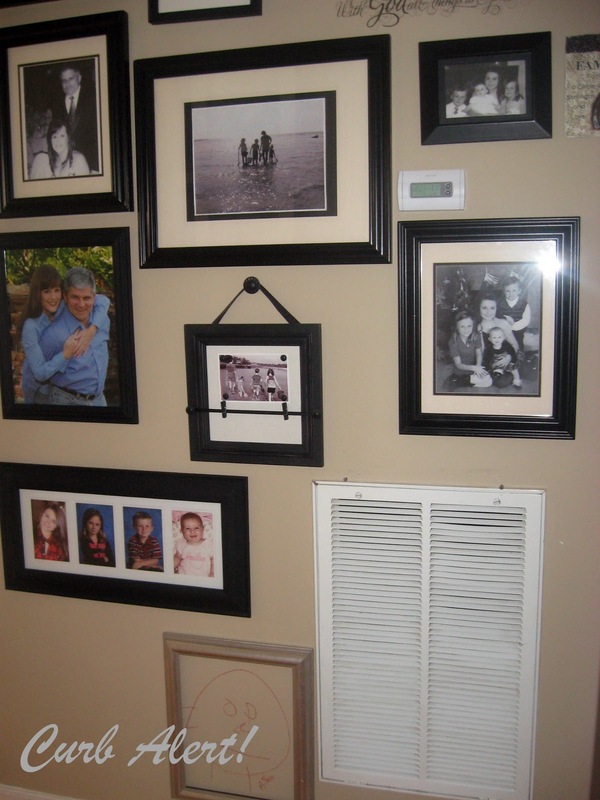 Here is a Before shot of my Gallery Wall where the AC Return Air Vent is beautifully displayed right there one the edge of it. Pretty difficult to hide as it is right outside of my guest bathroom! There is also a second one located above all of the pictures as well! Double Trouble! I just put in two screws and hung up the door mat. So easy! I may not be Brilliant but feeling a little awesome at the moment. Nothing like a little bit of instant gratification!!! 1. 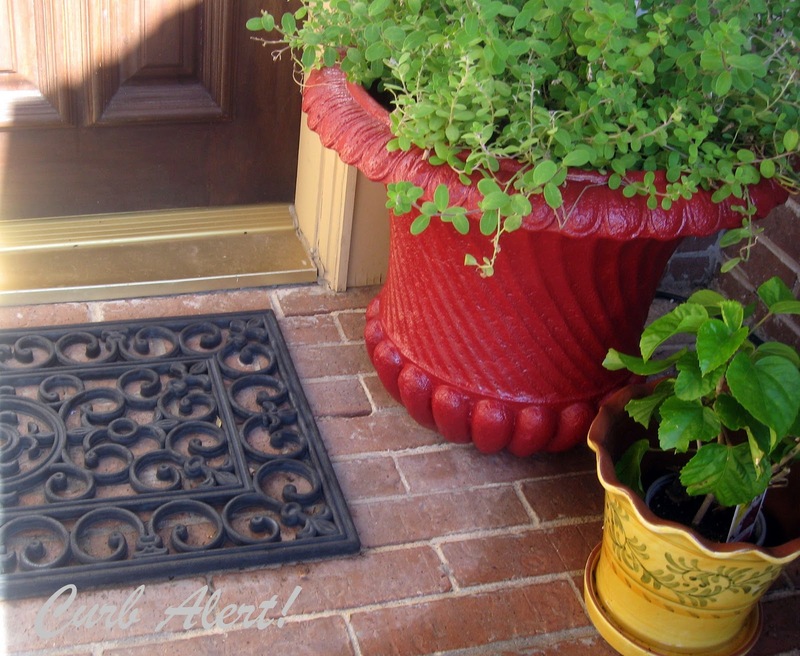 When searching for a rubber door mat, try to find one that allows plenty of airflow, meaning that the door mat has a large amount of space in between the rubber sections. 2. I have two air vents, a second one is located about 4 feet above the one shown and I have decided to leave it as is and unobstructed for maximum airflow. 3. I have consulted with our HVAC Air Technician and he has agreed that the doormat leaves proper airflow for our home based on our own situation, definitely consult with your own Air Technician to ensure that you get proper airflow before using it on yours. Our technician was already on call for our yearly checkup so it was no additional charge to check it out. 4. 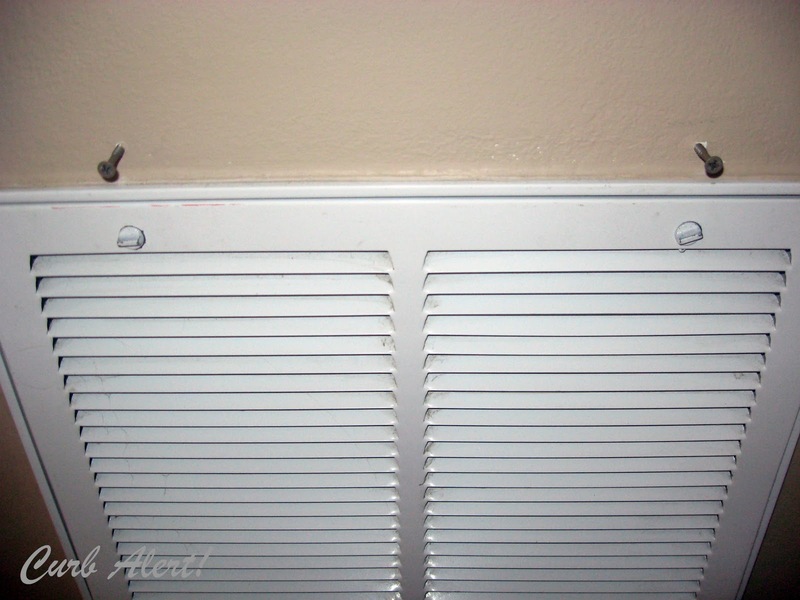 Open up your airvents a little by raising up the individual vent panels with pliers to allow even more airflow. I think it looks great! Definitely a LOT more appealing than the white air vent! I love how it took me a total of about 5 minutes to complete this project and cost me a whopping $0 (BAM!-high five from My Love right there, although he will probably think it looks stupid on the wall). That’s okay, that’s why he’s in charge of “making the donuts” and I am in charge of the home operations! Love the idea and love your site! Thanks for sharing! I know what you mean about Pinterest…it's so addicting!!! Thanks for the heads up on this one! Your feature will go up this weekend. You are so cute Tami! I love to see what you are up to next. Thanks for sharing. Oh my goodness, I love this idea! Awesome… gonna have to try this! Tami, this was an awesome idea! Isn't it funny how we come up with stuff sometimes? LOL!!! This was really good! Tami I am so glad I came across this we have one of these things in our apartment I thought we couldn't cover it but anyway I am glad I show this tfs!! I am so impressed by your resourcefulness! I too was appalled at the cost of the cover and WAALAA you solved it!! thanks!! I love it! 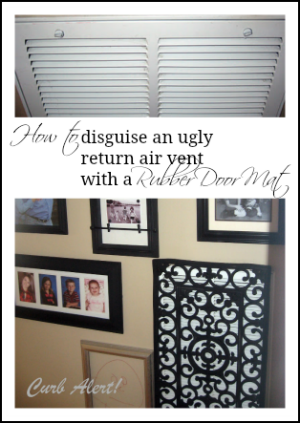 I would go one step further and hot glue black a window screen to the back of the doormat to disguise the white of the vent cover a bit better. Or maybe that would be enough to remove the cover all together. Hmm. Sorry this is "anonymous", my name is Betsy. I was also thinking – just to throw it out there – that you could take the idea of a wall hanging made from a spray painted door mat just like that one and hang it over the return. That way you could match your decor if you so desired. 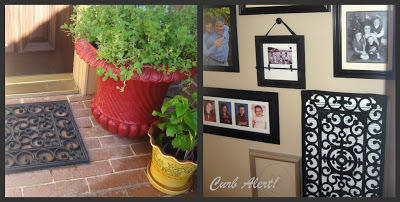 The idea was also in pinterest (they sanded the paint off it a bit here and there to give it an antiqued or aged look). Just a thought – LOVE the interpretation, though!!! I don't have the budget for the original – so you saved me much heartache! Awesome job!!! That's totally creative! 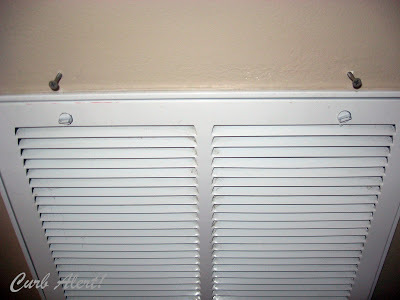 I also have vent registers throughout my house and they stick out like a sore thumb. I paint them the same color as my wall color to disguise them. But I think the door mat over the painted register makes for a very creative piece of art work! Thanks so much for sharing! Great job and idea. I would say to take the vent down and spray paint it black with some Rustoleum paint with primer. Oh! That's FABUlous! I *love* curb crawling. Neat idea. I have to say how much I love that you framed your kid's mural on the lower part of the wall, LOL! Too cute! Brilliant! found this on Pinterest and can't wait to look around your blog some more. Thanks for the idea. You are brilliant! I have wanted to cover mine too it is huge and right under my beautiful niche and makes it look silly! I found them and was shocked at the prices. I am so going to do this! Thank you ! 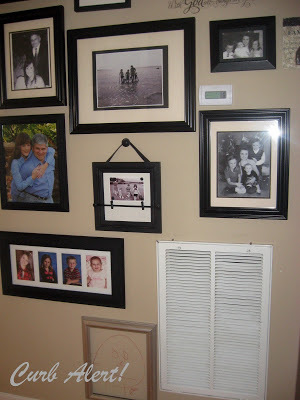 I did similar thing to mine, but painting my white vent thingy the same color as my wall. It camoflaged it much better. Think painting it the wall color or lighter would look great too! I was thinking that it would blend a little better if you painted the register the same color as the wall. My mother-in-law painted mine as a "favor" but then proceeded to touch up my walls with the same shiny paint. Too bad my walls were egg shell finish! Cute idea! Please remember the original function of the register, it needs air flow and the size of the register is the amount of air your furnace/ AC needs. I definitely would not put screen over register. It would restrict the air flow and you would have a constant collection of dust, lint, hair, etc…not pretty. How clever are you!!! Can't wait to do this! 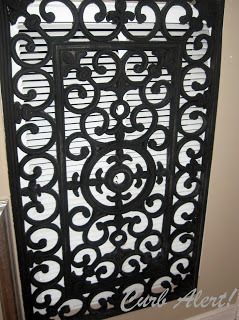 You could also remove and paint the white grate in a matching color and then the two would blend together even more. Jill, you are reading my mind! I like the idea of painting the white return. Problem 1 solved! Now, does anyone have a suggestion for hiding the thermostat cover. I have this problem in my hallway, gorgeous pictures and then this . . . thing!! Help! Great idea!! I'm gonna have to try this for sure. 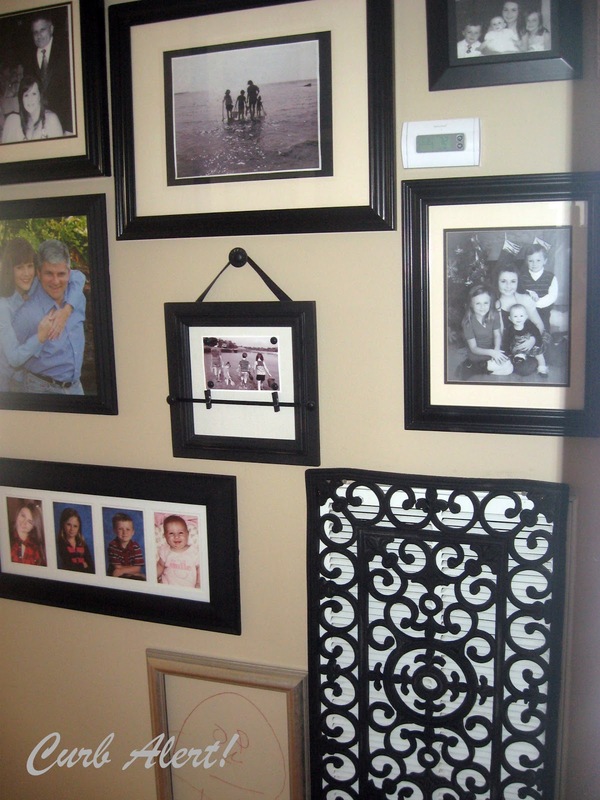 Jill, I saw a Pinterest pic of someone who put a pretty frame around their thermostat. Maybe try something like that. I was going to do this but my husband won't let me. 🙁 he said it will reduce air flow and eventually cause the ac system to freeze up….boo! Mawry….. Your husband is correct, well sort of. IF you were to take the louvers and open them up more. Open the grill and bend them down slightly with pliers. Also keeping a clean filter in there will also help. A dirty filter will cause way more harm to an HVAC system than the slight increase in restriction from the mat. This is based on my 15+ years in the HVAC industry. Brenda…. Don't cover your thermostat well unless you want to system to always be off a few degrees. Keep in mind that in this case the area through which the air goes is probably restricted about 1/3. That's not that good but, as anonymous said above, if you turn up the blades a bit and keep the filter clean you should be fine. However, if somebody is planning in covering their grille with a rug or something else that is bolder or restricts the grille even more, be careful. I am a huge Van Dykes fan as they are only about an hour and a half from here. They used to have a store that you were able to browse around in and I would make a special trip to see what great treasures that they had. They have now closed that down and gone to internet shopping instead. I think the use of the fancy door mat is GREAT thanks for the great inspiration. I love this idea. I would also spray paint black the vent to make it look just like the expensive one. Thanks for sharing! 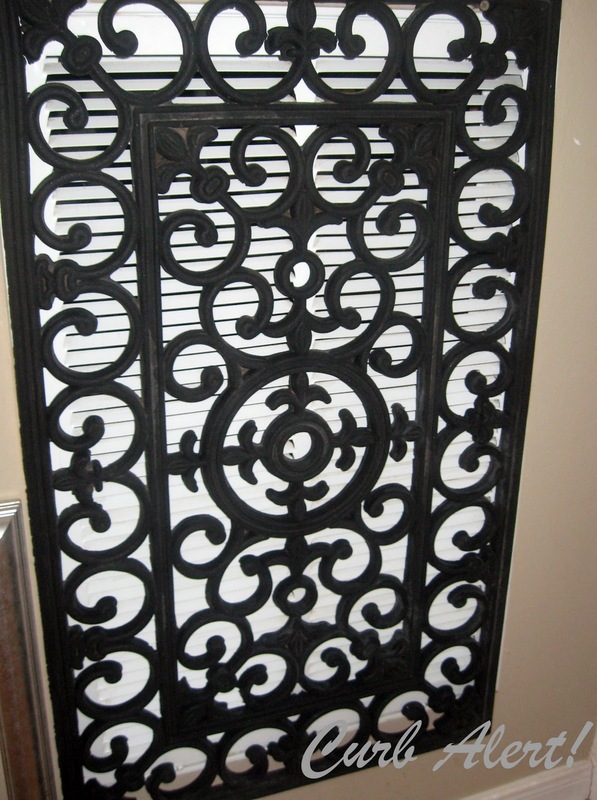 I'm thinking window screening, wood frame and the pre done wood scroll work from the hardware store put it together with a little paint remove old cover all together save the hinges screw in frame and it would look a lot like the top fancy one for just a few bucks. If you painted the air return the same color as your wall it wouldn't stand out so much and with the door mat over it would really blend in! What a great idea, Tami! Looks much nicer now, and good idea to check for air flow. Debbiedoo was talking about this on her blog, and I zipped over from there. Yes that is brilliant! I may have to pass this on! Thanks! LOVE IT! First stop when I get off work is Target for the mat…..look out guest bathroom! Unfortunately, those like myself, allergic to latex, would not want to place this in the way of air flow in the house. Personally, even having the rubber mat in the house would cause asthmatic reactions. 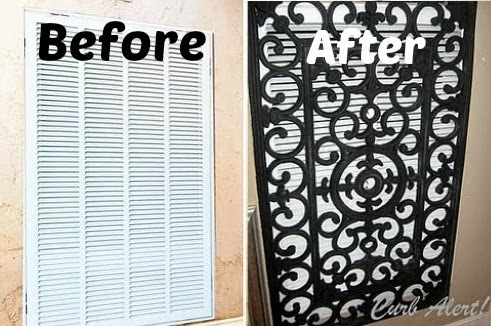 I do like the idea of covering the hideous vent… I think I will search for an old or unique iron trellis to weld onto the vent, the spray paint! I need help with a floor vent. My boyfriends elderly parents are moving into a house that has a floor vent and we need an idea to cover it up. Not so much because it is ugly, but mainly because it kills your feet when you walk over it. Any ideas on how I could secure this to that vent cover? Like I said they are elderly and we can't let them trip. I don't think this is a good idea. A lot of these mats are made from recycled tires and could affect some people's allergies/asthma. However…if you paint if and hang, elsewhere, as a decorative piece, it would be nice. I just wouldn't want any particles from recycled tires blowing in your house, getting in your lungs. Tammy love it. You could also spray paint the vent too. I love your idea! rubber door mats .Nice creativity. WOW!!! Such a great designs of Door Vent.. Thanks for this beautiful designs. Dampers are attached to the heating and cooling ducts in your home, and conditioned air is then distributed to different parts of the house as needed. This system is perfect for homes that have large open areas either in the floor plan or near the ceiling, such as a loft or atrium. It can be very expensive to heat or cool these large areas at all times, so having a system to switch off heating or cooling in these areas can save you money on your energy bill. If you're interested in determining whether a zoning system would be right for your San Antonio home, contact Chahat Enterprises Air Conditioning Repairing Services. Pure genius! When we built our home the heating guy was going to put that vent next to our fireplace about 5 feet up the wall. I told our builder there was NO WAY it was going there. We put it in the ceiling, it blends right in, and no problems with the air flow. I love all of the ideas, but I am planning to use the floormat over my return just as soon as I can find one. Thank you. If the issue is air flow, why not take the cover off the vent and hang the floor mat?